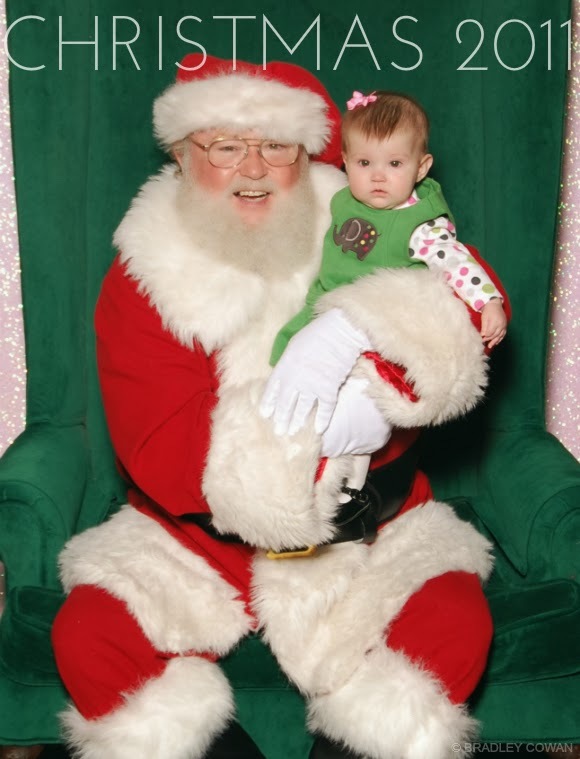 Madison was six months old the first time we took her to sit on Santa’s lap for the obligatory childhood Christmas photo tradition. At the time we didn’t realize, but looking back it’s abundantly clear, that her age worked in our favor as far as helping us get a decent picture. 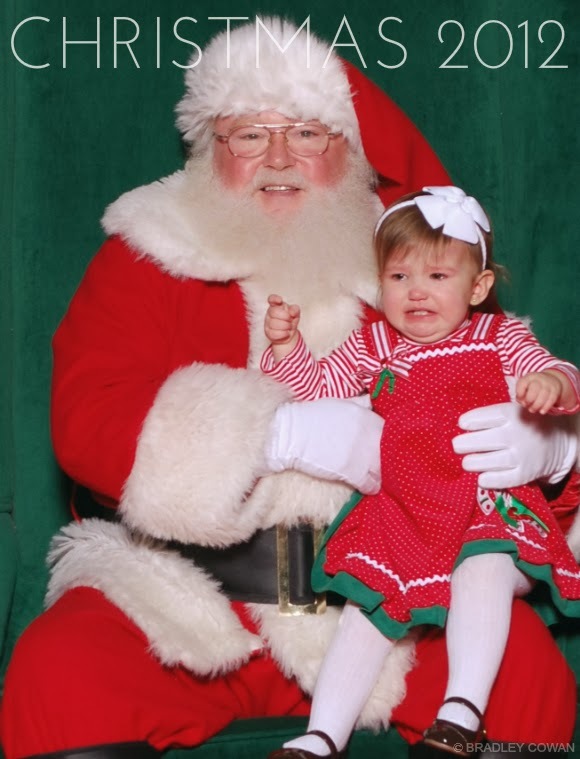 Fast forward to the following year when we found the challenge of sitting her upon the knee of a random man donning a red velvet suit in the middle of the mall to be significantly more difficult. In fact, it was almost impossible. If you were forming an opinion from the outcome of the photo alone, you would think it was painful. This year we attempted to prepare her well in advance in hopes of a better experience the third time around. We spent days leading up to what has become the annual meeting of Santa Claus reminding her she would get to tell him in person what she wanted for Christmas. That he was friendly and nice and, well, jolly. We planned to take her one night after work so when the day came we woke her that morning with the news that tonight was the night and Santa was waiting for her. Once we got home from work that evening, Madison welcomed us with excitement and couldn’t wait to get dressed so she could finally see Santy Cause. We mirrored her enthusiasm and made our way across town taking our place in line among the glitter covered cardboard displays surrounding a large green chair kept warm by a bearded stranger. Madison waved at Santa and made eye contact a few times even smiling at the other kids climbing onto his lap. She would say it’s almost my turn every so often after we stepped forward. Then, finally, it really was her turn. Madison climbed me like a tree as I headed towards Santa. I tried to let her walk, but she gripped the back of my shirt as if I were throwing her over a ledge. 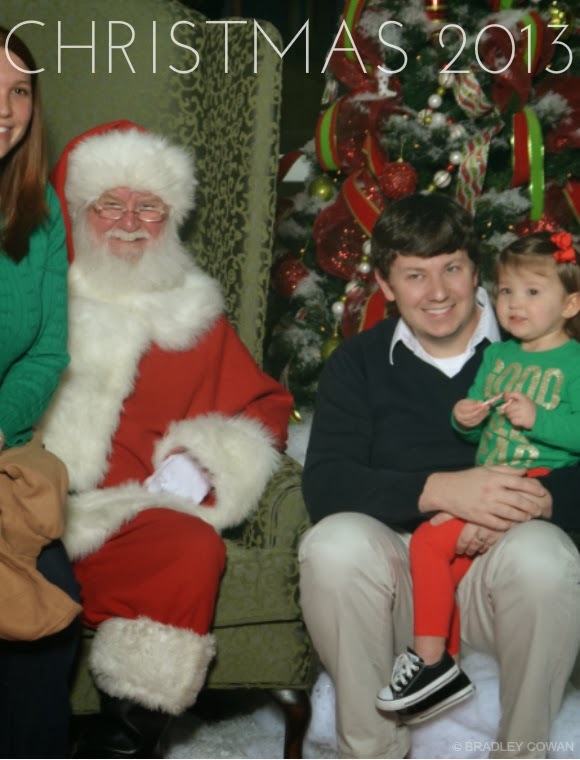 I kneeled in front of Santa while he handed her a candy cane in hopes she would warm up to him since she saw I was right beside her, but she took the candy cane and gave him a high five while clenching the skin of my neck like a wild animal. I moved her towards his right knee, she screamed. I immediately pulled her away while trying to calm her in my best soothing father voice, but I could see in her eyes she wanted to punch me in the mouth. So I moved over to sit on the stool designated as holding Santa’s candy cane stash, moved the box of individually wrapped bribes and sat down with Madison on my lap while quickly thinking of some sort of compromise to get this picture over with. Allison is cropped out (by her own demand) and I’m resting on a stool that I imagine could collapse at any moment. Madison is clearly ready to go. Maybe next year we’ll skip the meet-and-greet and wait for the presents. I feel like we’ve all been traumatized. Memories we’ll treasure for years to come. And this is why we don't take J to see the mall Santa :). I'm sure Madison isn't traumatized! Lesson learned, I suppose. In hindsight, it's fine with me that Madison doesn't want to sit on some strange man's lap! We might eliminate this part of our Christmas tradition going forward unless she specifically requests a visit then we can reconsider.